Kitchen disasters. We've all had them. But oh, the joy when you salvage the mess and rise from the ruins! I don't usually post my creations when I don't have a recipe to go along with it, but I'm a bit more relaxed these days. Plus, I was actually quite proud of how I saved the day, so here we go. My only regret is that I didn't take a picture of how awful the batter looked at the beginning, which would make the results here look all the more impressive. Hey, we can't have everything. It all started with an idea. 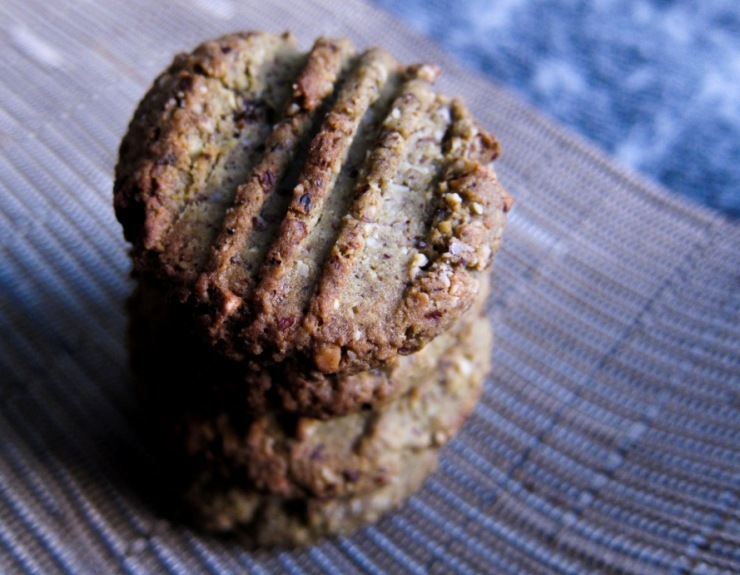 Gluten-free buckwheat matcha cookies. 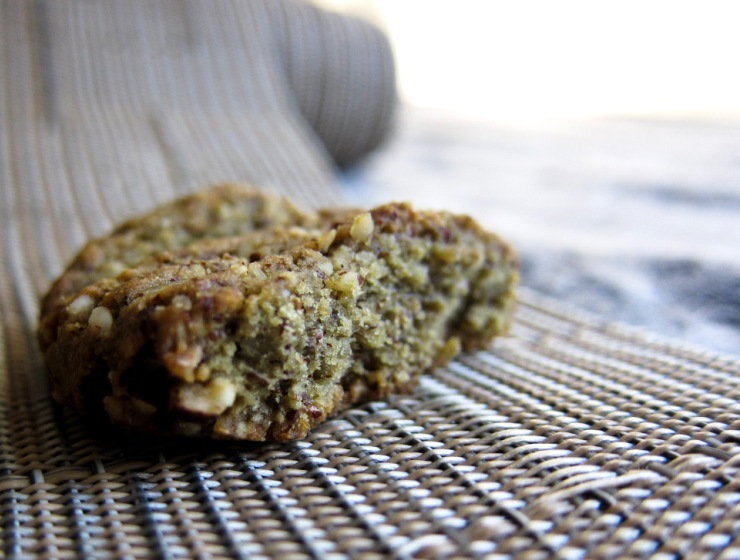 gluten-free buckwheat hazelnut matcha cookies. When I have an idea, I like to draft out a recipe and then adjust it in the real world, adding and subtracting as I mix, knead and taste. In this instance, I had underestimated the amount of buckwheat flour I needed... and not only that, I didn't have any more of it left in the pantry. The batter was neither liquid nor solid, and it was crazy sticky. Shaping or cutting it into cookies was out of the question. I made a makeshift piping bag by cutting a hole in a plastic sandwich bag, and forced in the batter. Bad idea. The consistency wasn't good for piping either. And the batter was so gluey, I now had trouble getting it out of my makeshift piping bag. My typically trusty spatula looked dirty, tired and helpless. SO I DECIDED TO USE MY HANDS. Desperate times call for desperate measures, or rather, they drive you to insanity... I know that now. Feeling wretched and with gummy green goo all over my hands, I imagined I looked not unlike a forlorn swamp monster. I still refused to throw the lot away. Organic buckwheat flour ain't cheap, y'all. Thinking hard, I remembered the hazelnut meal I bought a few weeks ago. Oh, come here, my pretties, and rescue me from the mire of despair! I finally had a workable batter, which I rolled into balls, then pressed down with a fork on the baking sheet. Fifteen minutes later, we have these babies. Not bad, really. 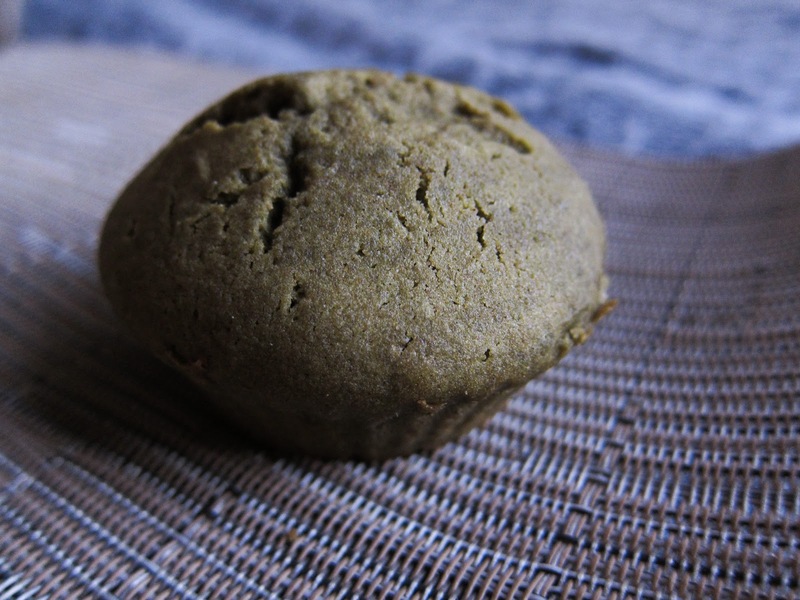 Cross-section of gluten-free buckwheat hazelnut matcha cookies. At some point during these calamitous proceedings (it's all a blur to me now), and before the hazelnuts came sprinkling at me with heroic exultation, I had, in a moment of resignation, decided to go with the flow, as you do, stirring more cream into a small portion of the batter, and pouring it into a cupcake/muffin case. Amidst the confusion, I nearly forgot about this little cake-in-waiting, but spied it in the nick of time and it went into the oven with the cookies. It looked alright. It tasted even better. I mean, it tasted really, really good. The cookies were not bad, but this mini cake, soft, moist, and rich, was seriously luscious. cross-section of gluten-free buckwheat matcha cake. Wow! What a great story . . . and a great recovery. My disasters usually end up in the garbage. Except for the pistachio quick bread that looked awful in its batter stage till I added cocoa powder. I guess as far as disasters go, there is usually still hope at the batter stage. :) Your cocoa-pistachio bread sounds good! Nice work! These both look really good, so I think you did a lot better than I did last week when I flopped two tarte tatins one straight after the other. The shame! Oh, sympathies. Third time lucky, I hope! Great recovery! Now you're going to have to do it again so that you can make the cakes on purpose. Buckwheat and matcha?! What an enormously delightful combination...both cookies and cake would work for me - I don't think I'd share either ;-). Totally begging for you to recreate this with a recipe. So good! you're brave not to burst into frustrated tears and throw the mess away! funny how "this ingredient was so expensive" forces you to soldier on! 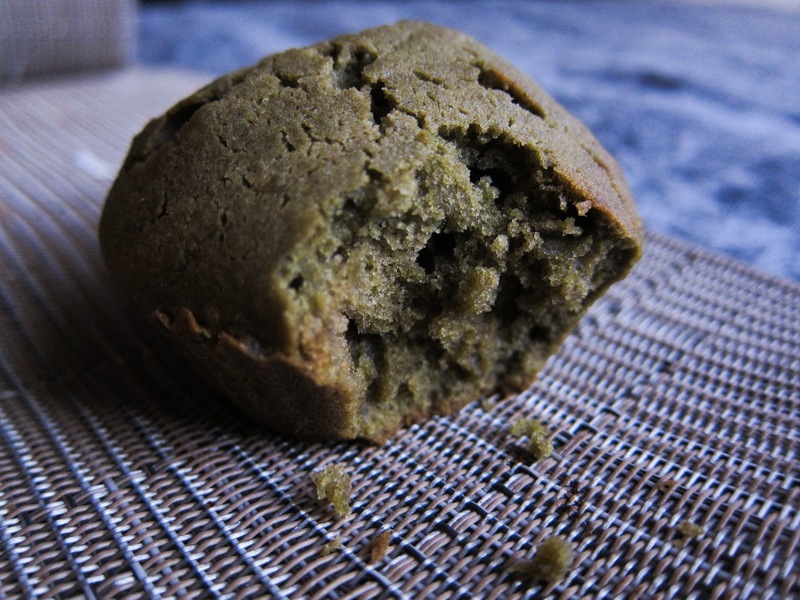 I love the story behind this single, gluten-free buckwheat matcha cake. I must admit when i'm in the midst of a kitchen catastrophe i usually throw in the towel (and have a big fat dummy spit). I admire your determination to "rise from the ruins". The result speaks for itself! Thanks! :) I figured if the batter still tasted good, all's not lost! Great save! I would want to save the organic buckwheat flour, too. It's always nice to see stories like these on food blogs! What an adventure - that little cake sounds fantastic though! Clap clap. Well done for rescuing it! I make a lot of things with buckwheat flour, but rarely bother to alter the recipe as much as I really should when switching from regular flour to buckwheat. This inspires me to try a little harder next time! That sounds so tasty! I love matcha green tea flavored sweets, have never had it in a cookie form though, very creative! Talk about a great save! That also looks matcha cake pretty darn good to me.